Shooting with other photographers is a great opportunity to learn and improve your craft. Even just by watching videos like the one above, you pick up things to implement on your shoots or avoid at all cost. Diamond, Kobeissi, and Woelfel have very different styles of photography and ways to work as you can notice. 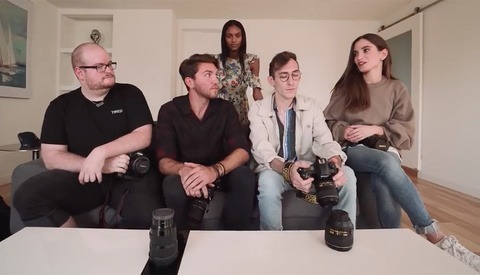 For example, it’s interesting to see how a photographer famous on Instagram like Woelfel seems frightened not to be able to edit his own images, or how someone like Diamond isn’t excited to shoot with a smartphone. Such challenges are fun to watch, but it’s also something you should try for yourself, either by shooting with others or by putting limitations on yourself to push your creativity. You’ll see that it’s not as easy as it seems and while it’s easy to laugh at other photographers that struggle with specific challenges, it’s more challenging to try those obstacles. What do you think of these challenges? Do you enjoy watching these battles? I’d love to hear your thoughts on this series in the comments below. Yawn. Amateur images. Boring challenge. How does one define an "amateur" image? Or is that just an arbitrary elitist thing designed to make oneself feel somehow superior? In this case, if your eyes and your aesthetic sensibilities are failing you, I would define amateur as poorly composed, poorly lit and poorly styled. As far as the reason for my comments, they were in response to the query by the author, "What do you think of these challenges? Do you enjoy watching these battles? I’d love to hear your thoughts on this series in the comments below." You describe all subjective attributes. That has nothing to do with being amateur (or professional.) So effectively: "I am not aesthetically drawn to X, thus X must be amateur?" Sorry for entering the discussion but, how would you qualify something as "amateur"? Surely composition and lighting would have to be considered. Not necessarily the specifics of each but rather their appropriateness for the subject and intent. For the record, I'm not categorizing them one way or the other. I'm not nearly objective enough to make such a conclusion. By its definition: "a person who engages in a pursuit, especially a sport, on an unpaid basis." Good guess, but not this case. It wasn't a guess. I was trying to lighten up the mood. Why does having an opinion make someone petty and insecure? The author asked what I thought of this challenge and that was my answer. What was asked was your opinion on the challenge, what makes you petty and insecure was your sad put down of the work at hand. By all means, lets see your exciting and professional images. Agreed. And no point made except personal branding. This reminds of a new youtube channel I just discovered, Random Camera Junk. I immediately thought if someone had a Sony with eye track, they would have killed the no looking in the view finder challenge. I had the same thought while watching the video. I will confess here, I am LAZY! Ok so I am glad that I got that out of my system. I like taking photos and as a computer professional who did an apprenticeship as a photographer, the thought of spending hours in front of a computer trying to drag an image I like out of a raw file is about as attractive as a Rattlesnake in a lucky dip. Not to say I never post process, but I aim to get 85-90% of my images right in the camera. Now some cameras from my experience seem to be better than others. My weapon of choice would be Olympus, Nikon, Sony or Fuji not necessarily in that order, YMMV! I will admit that for the use of my images I can get away with it as most are used for the web so after they have been squashed, compressed and otherwise mangled most of the quality that I worked to put into the images has been lost. So from that perspective my take is that the challenge was a valid one. It does make you pause before you click the shutter, although I will confess to a bit of bracketing and selecting the best image. I will also say that many of my pictures you would say are "amateur", but I will say that they are what the client requested and I got paid so who cares? But then again I am a computer professional first and a photographer second. I make a bit of money from photography, but then I don't rely on it to live on, so my view is very biased, but then I consider it valid, but then I would! Are they paying you to feature them every single week? I mean Dani is pretty good photog, but too uniform in look and style like all instagramers (not half artistic), but the rest are not even half decent photographers. And this is Jessica's channel. There are so many good yt channels and photography videos that are overlooked.